This has been a work in progress for sometime. I've been aware of hazers for years. 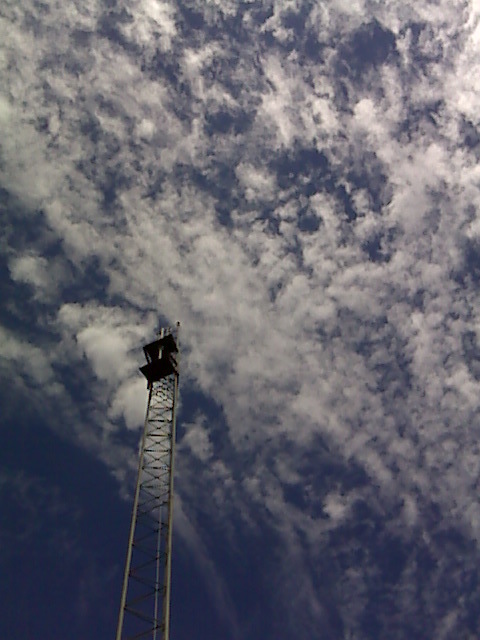 The Glen Martin Tower Hazer is one of the most popular. 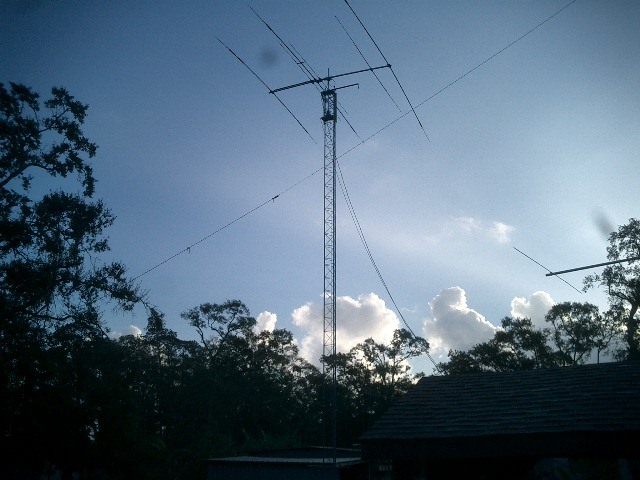 I never thought about it much until John, W5JON bought a tilt over 60 foot tower about a year ago. 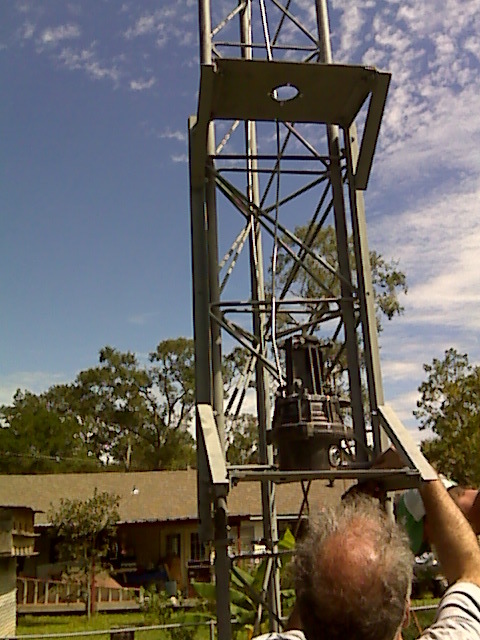 He spent over $10,000 on tower and installation. 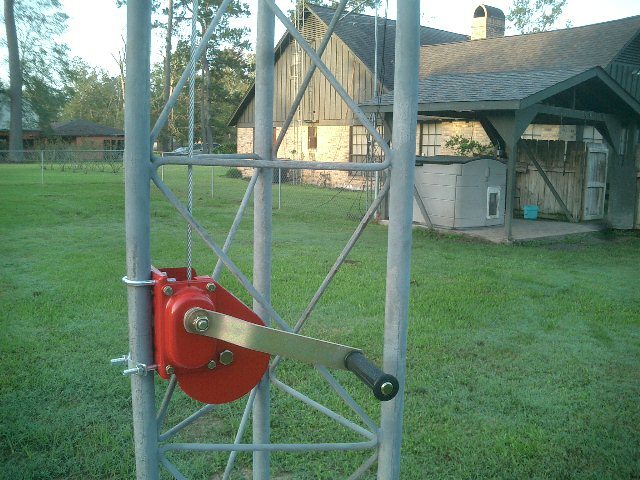 It features a heavy duty electric screw winch that lets the whole antenna/tower down in just a few minutes. I just couldn't afford that. With the age of hams, including myself getting older, most of us can't/don't climb anymore. 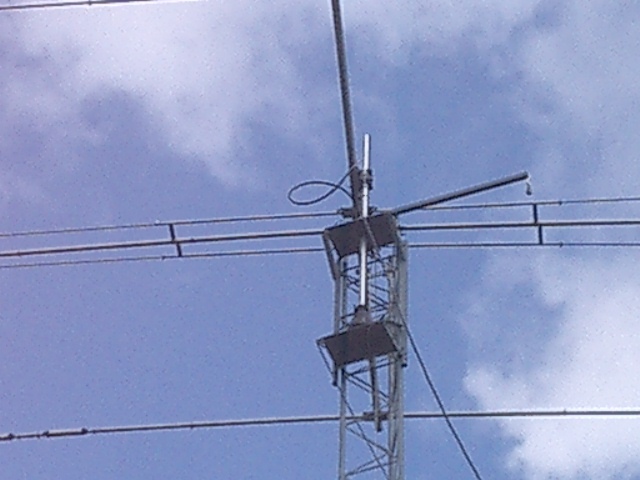 I have been a slave to my antennas mounted on my tower all these years. Always having to find someone to climb and usually having to pay them. 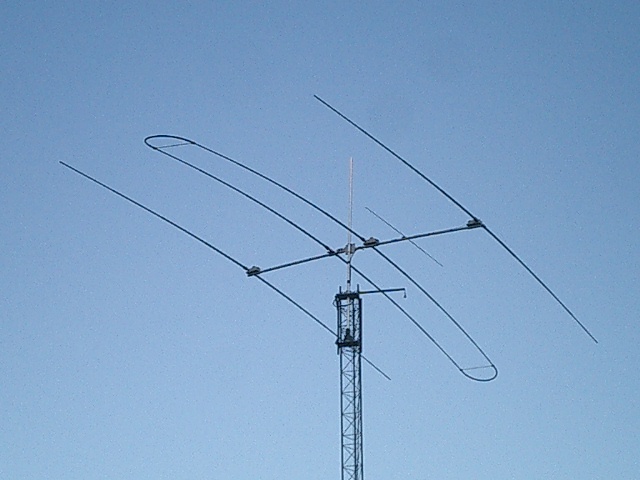 I bought the Rohn 35G tower a couple of years ago from a friend in the club from Livingston thinking I would someday either use it, or peddle it to someone else. It's generally like Rohn 25G, just 3 inches wider between legs. At the time he sold it to me he said it was Rohn 45G and I didn't know any difference. I didn't find out it was actually Rohn 35G until I helped a friend of mine pick up some Rohn 45G he bought from a ham in Pasadena. I saw a home made hazer for Rohn 45G from a Florida ham selling it on e-bay. This was in August of this year. That's when the wheels started turning and I got the idea to buy or build a hazer. I found out quick that I couldn't find one for Rohn 35G. 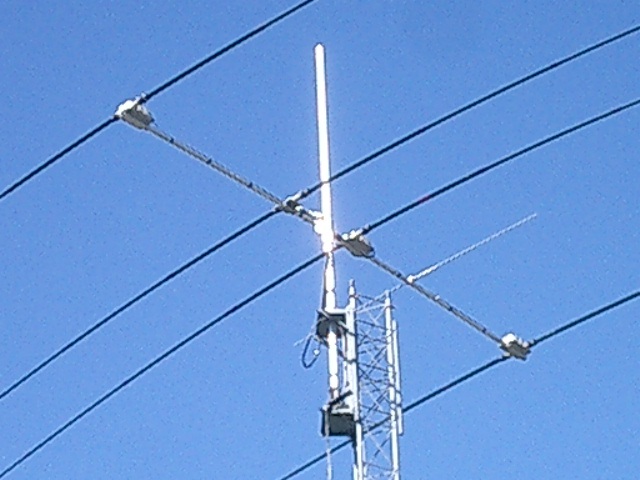 Rohn 35G was manufactured for Motorola for their communication towers. It was never sold commercially to the public. That's why you will never find accessories for that tower. 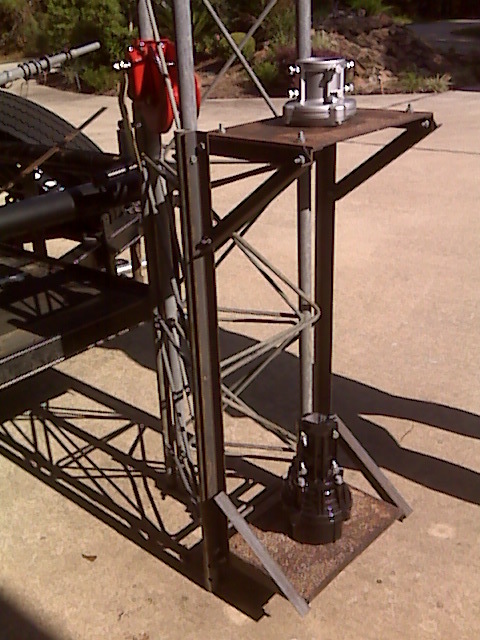 No rotor plates, thrust bearing plates, hinge plates, etc. There's a lot around from hams who have taken it down in various places and resold it to others who like me, found out they had to fabricate everything for it. It was just by chance that Jesse, KB5YC and Ron, ND5T found out a piece of Rohn 45G would fit perfectly over a piece of Rohn 35G with enough clearance to move up and down. Jesse had some 45G that was bent. We cut a 42 inch section and that became our shell for the hazer. We fabricated all the rest. Really wasn't brain surgery, just took Ron's well equipped shop, mechanical expertise and several hours of cutting and lining up everything. Now we have several others that want hazers. Imagine that? The next one we build is for KB5YC, Jesse. It may be built from aluminum to lighten the load and no rust to worry about. 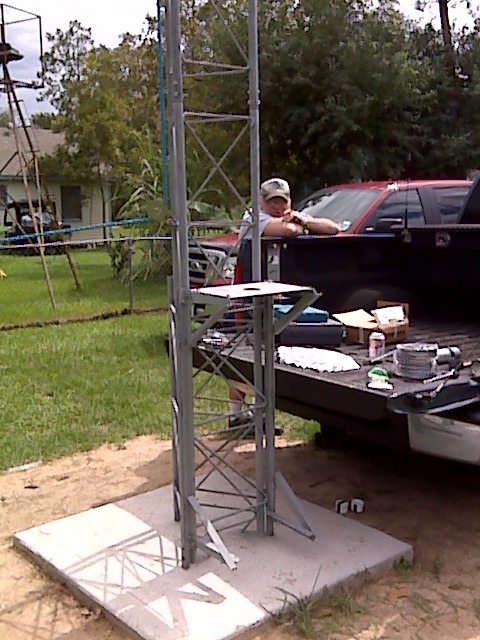 Because of the steel plates, I had to coat the entire hazer with "Cold Galvanized Paint", It's the same color as the tower and looks great. If you have any questions contact me, K5MV, Ron, ND5T or Jesse, KB5YC. 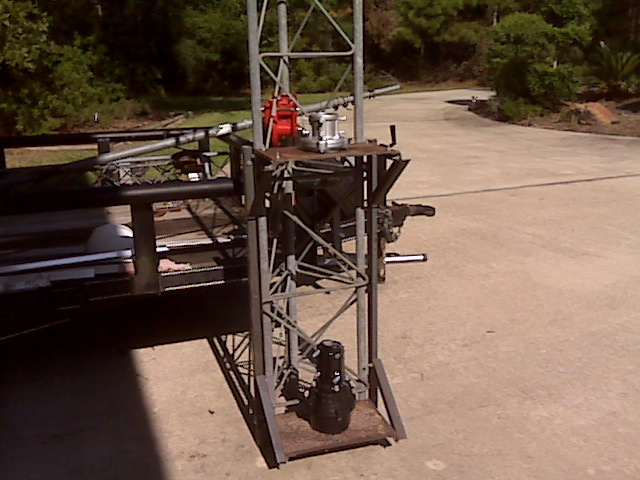 The Hazer is pulled up and down the tower with a hand winch with a built in brake. 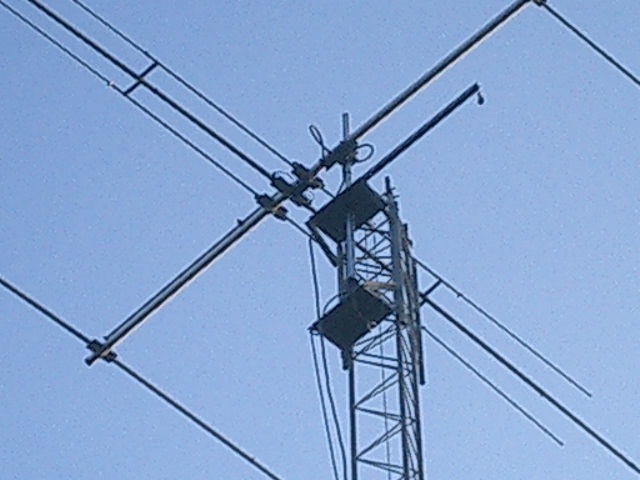 This is so that if your hand slips off the handle the antenne's stay put and nothing will come crashing down. 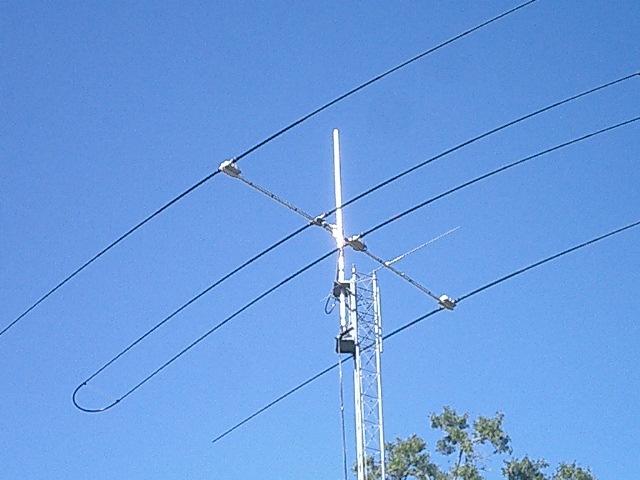 The new SteppIR, 40 through 6 meter yagi antenna is now up and operating great. 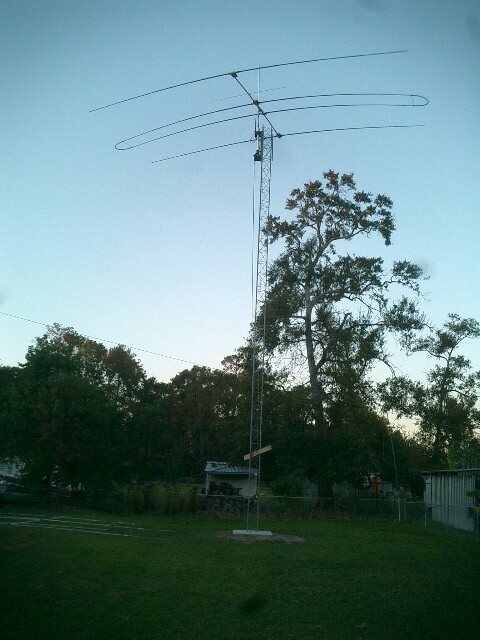 After a long day on Tuesday November 3rd, Johnny, W5JON, John KF5CL, Ron, ND5T and myself finally raised the antenna resting on the fabricated hazer recently built at Ron's, ND5T. Thanks to all the guys for all the hard work. It really was fun watching this project come together and everything work properly at the end.